First Czech astronaut. Mission to swap Soyuz lifeboats docked to station. AKA: Salyut 6 EP-2;Zenit (Zenith). Launched: 1978-03-02. Returned: 1978-03-10. Number crew: 2 . Duration: 7.93 days. First international 'Intercosmos' team consisting of A.A. Gubarev (USSR) and V. Remek (Czechoslovak Socialist Republic). Conducted scientific research and experiments jointly developed by Soviet and Czechoslovak specialists. Recovered March 10, 1978 13:45 GMT. Visiting Expedition 'guest cosmonaut' Vladimir Remek was the first non-U.S./ non-Soviet space traveler. 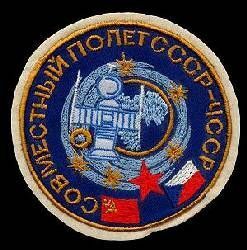 He flew as part of Intercosmos, a program of co-operative space activities between the Soviet Union and other countries (especially those in the eastern bloc). Remek's experiment program touched on life sciences, materials processing, and upper atmosphere research. Family: Manned spaceflight. People: Gubarev, Remek. Spacecraft: Salyut 6. Bibliography: 182. 1978 March 2 - . 15:28 GMT - . Launch Site: Baikonur. Launch Complex: Baikonur LC1. LV Family: R-7. Launch Vehicle: Soyuz-U. Soyuz 28 - . Call Sign: Zenit (Zenith ). Crew: Gubarev, Remek. Backup Crew: Pelczak, Rukavishnikov. Payload: Soyuz 7K-T s/n 45. Mass: 6,800 kg (14,900 lb). Nation: Russia. Agency: MOM. 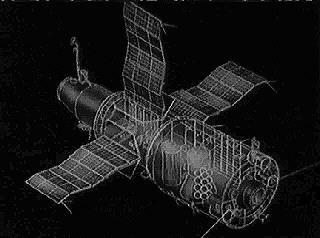 Program: Salyut 6. Class: Manned. Type: Manned spacecraft. Flight: Soyuz 26, Soyuz 28. Spacecraft Bus: Soyuz. Spacecraft: Soyuz 7K-T. Duration: 7.93 days. Decay Date: 1978-03-10 . USAF Sat Cat: 10694 . COSPAR: 1978-023A. Apogee: 246 km (152 mi). Perigee: 192 km (119 mi). Inclination: 51.60 deg. Period: 88.80 min. Manned two crew. Docked with Salyut 6. Delivery to the Salyut-6 station of the first international 'Intercosmos' team consisting of A.A. Gubarev (USSR) and V. Remek (Czechoslovak Socialist Republic) to carry out scientific research and experiments jointly developed by Soviet a nd Czechoslovak specialists. 1978 March 10 - . Landing of Soyuz 28 - . Return Crew: Gubarev, Remek. Nation: Russia. Related Persons: Gubarev, Remek. Program: Salyut 6. Flight: Soyuz 26, Soyuz 28. Soyuz 28 landed at 13:44 GMT. .